There are so many different ways that you could incorporate these cards into your homeschool. We all worked on one virtue a week as a family. 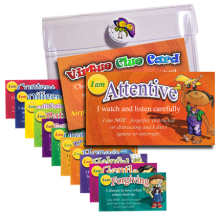 The cards are in full color and feature The Virtue Kids, their names, the Virtue catchphrase and antonyms, and on the back a "You can do it" challenge including what you can do and what you should not do! I placed our weekly card on the refrigerator along with our daily chore charts and prayer reminder sheets so that I knew we would see it each day and be reminded of what needed to be done. We also received the teacher's handbook. 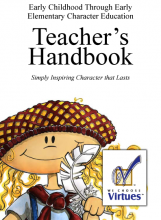 This book is also in full color and outlines the simple steps and inspiring tools that are needed to teach the this character education system in your classroom. There are special notations for teaching this system in home schools and home daycares throughout. 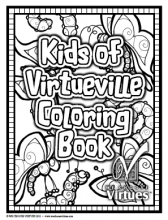 Another product available to enhance and keep these virtues alive is the Coloring Book. This book is only offered in PDF download and includes the 12 kids of VirtueVille. As I introduced the virtue for the week, the children colored the kid that went with that virtue and loved every minute of it! My children love to color - guess they got that from their mom! The coloring book can be downloaded for free with any kit purchase. 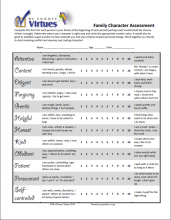 The last item that we received for review was the character assessment. This is a valuable tool for me to evaluate how well I thought each of my children did on the virtue for the week and also the virtues of the past weeks. It allowed us a time to talk about areas that they were doing great in along with those that they could work on more. There are lots of different kits available at the website, one including the homeschool kit for $99 or you can purchase the items individually as well. These products are recommended for elementary age students, ages 3-11, but I found that you can never outgrow learning virtues! I have a 13 year old who enjoyed these cards just as much as his younger siblings but they do have a set of books designed especially for youth too. There are also specific products available for churches and classrooms. Check out the clearance section going on now for even more deals! The virtue clue cards I spoke about first are available for a limited time for only $5.95! Don't forget to check out what my fellow crewmates thought of We Choose Virtues.